Discovering there was a horror movie in the works written by Joss Whedon, creator of the excellent Buffy the Vampire Slayer TV series was cause for great anticipation. This thrill was tampered more than a little by the revelation that the writer of one of my all-time, most loathed films was chosen to co-write and direct it. 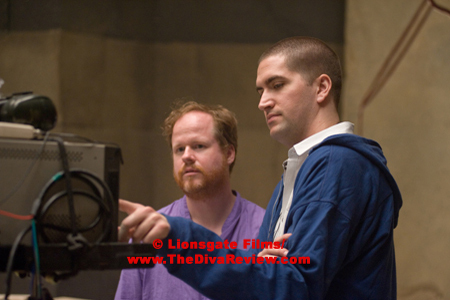 Drew Goddard the writer who helped revive cries of “Die Yuppie Scum” with the release of his sci-fi monstrosity. Cloverfield, collaborated on The Cabin in the Woods with Whedon, one of the most esteemed names in sci-fi and fantasy pop culture today. As has been the set up for horror movies since their late seventies and early eighties salad days, The Cabin in the Woods begins with a gathering of nubile college kids piling into a camper and getting away for the weekend to the titular destination. We have a couple in PDA-filled love and their boyfriendless pal, who they plan to hook up with a handsome hunk along for the ride, as well as a goofy stoner chum tagging along. Right from the start, the trip is laced with eerie tidings as a stop at a gas station uncovers an attendant with the worst customer service skills of all time, whose insults and portents of doom put a definite taint on the journey. The cabin itself isn’t much more hospitable; a ramshackle abode in the middle of nowhere with only one road leading to or from the property. As the cabin has a long history, the discovery of a very modern one-way mirror between two rooms only seems a mild curiosity to the band of merrymakers. It’s certainly not enough to stop their partying, which includes free-flowing intoxicants and campout games like truth or dare. One such dare reveals yet another oddity; a basement full of items from the previous owners, including the diary of a member of one of the most murderous families since those Texas Chainsaw Massacre folks. Reading the journal out loud seems to be a very bad idea as strange happenings begin to occur around our happy little group; starting with the amorous couple’s attempted commune with nature interrupted by a former occupant of the cabin. From then, all hell breaks loose and the friends try to flee the creepy house, but no matter what they do, it always seems like there’s something holding them back. As if some unseen force is purposely pushing obstacles in their path to safety and manipulating the odds against them. Surely, that couldn’t be. I don’t remember the last time I saw a horror movie as ingenious, fresh and downright fun as The Cabin in the Woods. It’s terribly difficult to discuss the details of the film without giving away secrets, which absolutely must be kept to fully enjoy the movie. It’s so off the wall that there’s no way to predict all the surprises, and the surprises are constant. It’s an incredibly novel and clever approach to the old totems of horror films that turns those tropes on their heads while still showing a healthy respect for the genre. The homages to horror films through the ages that pop up here are fabulous and one could probably watch Cabin multiple times (which one would most definitely want to do) and not get them all. There is also the looming figure of Joss Whedon and his “Whedonverse.” Allusions to the writer’s collection of past projects and characters must be included to satisfy his cadre of devoted fans and those references are interlaced throughout the film, most obviously by some familiar casting. The healthy dose of comedy and gallows wit that imbues The Cabin in the Woods is also a trademark of Whedon’s work. Cabin is meant first to be a horror film, so there is definitely gore, but it’s often of the ‘I shouldn’t laugh, but I can’t help it’ variety. The humour and ingenuity of the script nicely balances the slasher content without making it seem like a compromise. As evidenced at my viewing of the film, there are plenty of opportunities for people in the audience to yell advice to the endangered characters onscreen. Chris Hemsworth, who shot to notice as Thor from that character’s own Marvel live-action film, as well the upcoming Whedon-directed Avengers, plays the group’s alpha male. Yet, for all Hemsworth’s well-defined muscle, it is Fran Kranz as the stoner, Marty, who steals the picture. Marty’s cannabis-inspired wisdom is immediately dismissed, but later seems to bear the wisdom of a Shaman as his paranoia pays off. Every horror movie featuring nubile young people in crisis must have a Jamie Lee Curtis-type in its ranks and that part is handily played by Kristen Connolly as the shy girl whose (relative) purity might actually be an asset. Supporting roles by Richard Jenkins and Bradley Whitford are hilarious and deserving of their own spinoff film, which is all I can say without giving away major plot twists. All aspects of the film are very well done and unlike the director’s last creative effort, while there were chills, I was able to watch the whole movie without popping one Pepto-Bismol. Drew Goddard, you are (mostly) forgiven. Utterly novel and audacious, The Cabin in the Woods completely rewrites the scary movie as we know it. It’s intelligent, imaginative and too much fun; exactly what one would expect from the mind of Joss Whedon. 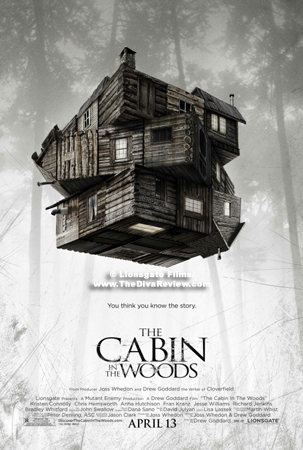 The Cabin in the Woods redefines and sets a new standard for the horror movies that will come after it.